Anyone out East London way recently can't have missed the large scale animals that have appeared on various walls, all in the space of a week. The works are by Belgium street artist Roa who was in town as part of the Zoo exhibition at the Brick Lane Gallery which finished this week. The Gallery have some photos from the show up on their site which you can check here. 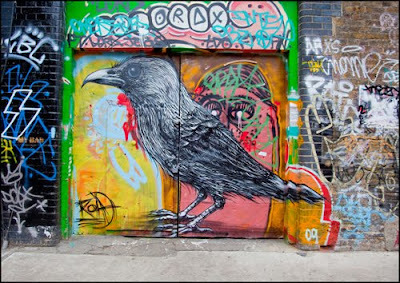 Plus there are also lots of other great images of Roa's London work on flickr. While in the country Roa also made a trip to Brighton. We headed down to the coast at the weekend and got to see the work Roa had created in Prescription Arts temporary home in The Old Music Library on Church street. The awesome street art above piece was painted outside at the back of the space and was one of four large pieces painted in the Gallery. Roa also created some work for the gallery space which you can view here. 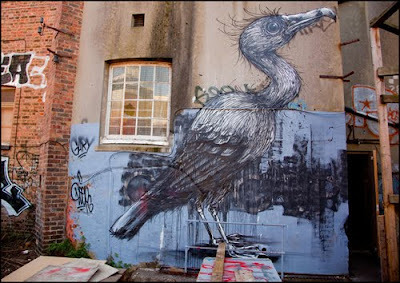 Expect to see more from Roa as a possible solo London show is in the works.